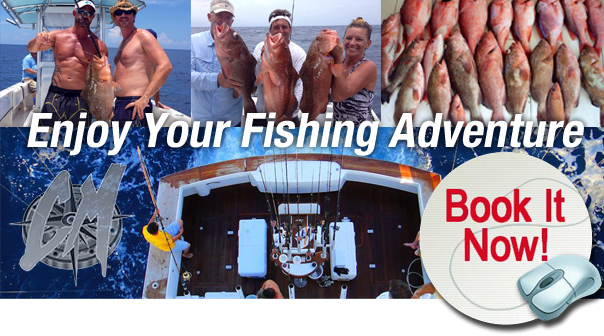 CAPTAIN MORGAN’S FISHING ADVENTURES, Inc.
CMFA GUARANTEES FISH OR YOUR NEXT FISHING CHARTER IS FREE!! Located in Tampa Bay, Florida. We specialize in offshore fishing at its finest. The Gulf of Mexico has some of the best Grouper and reef fishing in all the Coastal United States. If you’re looking for that adrenaline, heart pounding rush you get when hooking in to that monster Grouper, Snapper, Kingfish, Cobia, Amberjack, Tuna, Mahi, Shark or many other species that we target, you have found the right place. We cater to all skill levels Novice or Pro Angler and welcome children as well. Not only do we catch fish, but also our crew will work with you to perfect your fishing skills. We know that once you taken the adventure with us here at CMFA you will want to come back for more of the excitement. Captain Morgan’s Fishing Adventures ensures that you are provided a day like no other out on the open water. We want to share our knowledge of the gulf with you by putting you on the BIG ONES! We don’t play around here! With us you can bet that you will be yelling “fish on” all day!